One of the most valuable natural resources in Australia is rainwater. Collecting rainwater has been a primary interest in roof construction for several decades. Fortunately, the StoneSet system for permeable paved surfaces supports the harvesting and re-use of rainwater. Bear in mind that the state and territory health departments prefer people to use the public reticulated water supply for human consumption because it is filtered and purified. However, rainwater is perfectly viable for watering trees, shrubs and gardens on residential and commercial properties so why let the water escape when StoneSet can allow it to be used for just this. 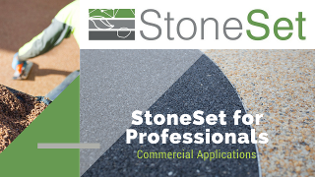 StoneSet is a porous paving system involving a gravel surface held in place with a binder. It can be applied over new and existing surfaces and allows water to pass through to the soil below. Properly channeling rainwater from a roof requires a series of gutters and down-pipes that lead to the holding tank. With a StoneSet installation, the tank is not necessarily required. The permeable gravel surface absorbs water from the down-pipes. The larger the gravel surface area, the larger the amount of rainwater to be stored. Instead of needing an eyesaw on the property, forget the tank and let the water sit in the decorative gravel until the ground is ready to absorb it. Reduces storm water runoff and soil erosion. Decreases the need for more dams and desalination plants. We are more than happy to answer your questions about using StoneSetyou’re your environmentally friendly project. Contact us today.